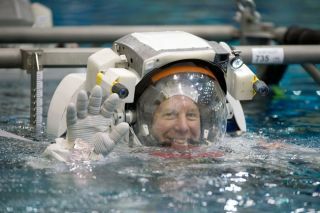 Clad in a training versions of his NASA spacesuit, astronaut Tim Kopra is submerged in the waters of the Neutral Buoyancy Laboratory (NBL) near NASA's Johnson Space Center for a spacewalk rehearsal prior to his flihgt. An American astronaut has brought social networking to newheights aboard the International Space Station, where he is ?tweeting? aboutthe ups and downs of life onboard a $100 billion laboratory that flies 220miles above Earth. NASA astronaut Tim Kopra is the latest active spaceflyer touse the Twitter microblogging site, and he?s thefirst to do it fromthe space station as an Expedition 20 flight engineer. He wasdropped off at the station by the space shuttle Endeavour's STS-127 mission,which landed July 31. Kopra is due to return home to Earth aboard the shuttle Discovery'sSTS-128 flight in early September. "What a fun shuttle mission -especially w 13 people on board station. Life here is amazing - still gettingused to floating!" Kopra tweeted Tuesday under the name "Astro_Tim." Kopra is ?a rookie astronaut making his first spaceflight.He is due to return home to Earth aboard the shuttle Discovery's STS-128 flightearly next month. Discovery rolled out to its Florida launch pad on Tuesday. Living alongside Kopra at the outpost are station commanderGennady Padalka and flight engineer Roman Romanenko - both Russian cosmonauts -as well as astronauts Mike Barratt of NASA, Frank DeWinne of Belgium and RobertThirsk of Canada. Thecrew is the first six-person team to live and work at theInternational Space Station (ISS), which hosted only three-astronaut crewsuntil late May, when the current expedition began. "These are thefirst tweets from a station resident," NASA spokesman James Hartsfieldtold SPACE.com. "The others we've done have been during shuttlemissions. There's a lot that'll give a neat perspective that we haven?thad." Kopra joins a cadre of other twittering astronauts,including his STS-127commander Mark Polansky ("Astro_127"), Mike Massimino("Astro_Mike"), who recently rode aboard STS-125 to overhaul theHubble Space Telescope, and Jose Hernandez, who tweets in English and Spanishunder the name "Astro_Jose" about training for his upcoming STS-128shuttle mission to the space station. All astronauts in space send messages to Twitter through anintermediary on the ground. They type their message via e-mail from a laptop onthe station or shuttle, and then, a few times a day, those messages are sentback to Earth. There, NASA personnel post the astronaut's tweet on Twitter.? Kopra, 46, was raised in Austin, Texas. He is a U.S. Armycolonel and West Point graduate who served in the first Desert Storm. Kopra waschosen as an astronaut candidate in July 2000. He is married and has twochildren. Kopra also plans to answer questions submitted on the Army'sWeb site.